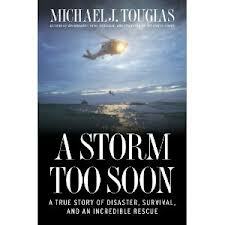 Michael Tougias will present a narrated slide/lecture at the Bridgewater Public Library on Tuesday, February 19th at 7:00 p.m. His topic will be: A Storm Too Soon: A True Story of Disaster, Survival and Incredible Rescue”, based on his non-fiction book of the same name. In “A Storm Too Soon”, Seventy-foot waves batter a torn life raft 250 miles out to sea in one of the world’s most dangerous places, the Gulf Stream. Hanging on to the raft are three men, a Canadian, a Brit, and their captain, JP de Lutz, a dual citizen of America and France. Their capsized forty-seven-foot sailboat has filled with water and disappeared below the tempestuous sea. The giant waves repeatedly toss the men out of their tiny vessel, and JP, with nine broken ribs, is hypothermic and on the verge of death. The captain, however, is a remarkably tough character, having survived a brutal boyhood, and now he must rely on the same inner strength to outlast the storm. Michael Tougias is a dynamic speaker, an award-winning author of 19 books and gives frequent lectures in and around Massachusetts. In addition to A Storm Too Soon!, some of his titles include: Overboard; Fatal Forecast, a True Story of Survival at Georges Bank; King Philip’s Indian War; There’s a Porcupine in my Outhouse; The Blizzard of ’78; A Taunton River Journey; 400 Miles Down the Connecticut River; Ten Hours Until Dawn. He has a new blog, where you can read his newsletter highlighting his current and future projects. This free program is funded by the Bridgewater Public Library. It will be held in the Flora T. Little Meeting Room, which is accessible by elevator. There is parking in back of the library, located at 15 South Street.